The advanced, environmentally friendly OLIMP pellet is used by our more demanding customers for the heating of homes, residential facilities and manufacturing plants – especially those located in city centres – and special protection zones. These pellets successfully replace: finely grained “eco”coal, coke, coal and culm, fuel gas and oil. The product is extremely easy to use for the user and environmentally friendly, thus ensuring respect for the neighborhood and the environment. The noticeably bright colour of our Olimp pellets is a symbol of their superior production quality. 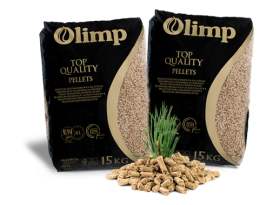 OLIMP pellets are environmentally friendly – CO2 emission during combustion is equal to the amount of CO2 absorbed by the plant during its growth, which means that no additional CO2 is released. minimum emissions of sulfur dioxide and other harmful substances. NOTICE: During transport and storage, protect the product from moisture. Use after unpacking, only in the facilities provided for this purpose.